The 2016 Northern Home & Cottage Home Tour in the Traverse City area takes place on Saturday, September 17 from 10 a.m. to 5 p.m. The Traverse City home tour treats tourgoers to 11 beautiful homes, thoughtfully designed and surrounded by stunning Northern Michigan landscapes in Grand Traverse and Leelanau counties. Proceeds raised during the home tour will benefit Northern Michigan non-profit, Child and Family Services of Northwestern Michigan. Save by purchasing tickets to the 2016 Northern Home & Cottage Home Tour at MyNorthTickets.com. The second home on the Northern Home & Cottage Tour is located at 5651 Ravens Roost Lane in Traverse City. The home was designed by Scott Norris Construction, 231.218.6849. When Bill and Rosanne Holmes learned that their daughter, a doctor newly recruited to Munson Medical Center, was pregnant with twin boys, the soon-to-be grandparents had an inkling that their days as 40-year residents of Howell, Michigan, were numbered. “I knew I could never be that far away from them,” Rosanne says. Soon after their daughter and her husband purchased a home in the quiet, wooded Cedar Valley Ridge subdivision west of Traverse City, Grandma and Grandpa Holmes made their move around the corner and through the woods from their daughter’s home. The Holmeses’ original plan was to build a timber frame house, and so they brought their ideas to a company that specializes in timber frame construction—only to come away disappointed at the cost. That’s when they turned to builder Scott Norris, who told them that a hybrid timber frame would give them the Northwoods look they were dreaming of but be within their budget. Norris could even provide the timber trusses from his company Grand Traverse Timber Frame. The couple was game for the idea, and Scott and his team went to work. 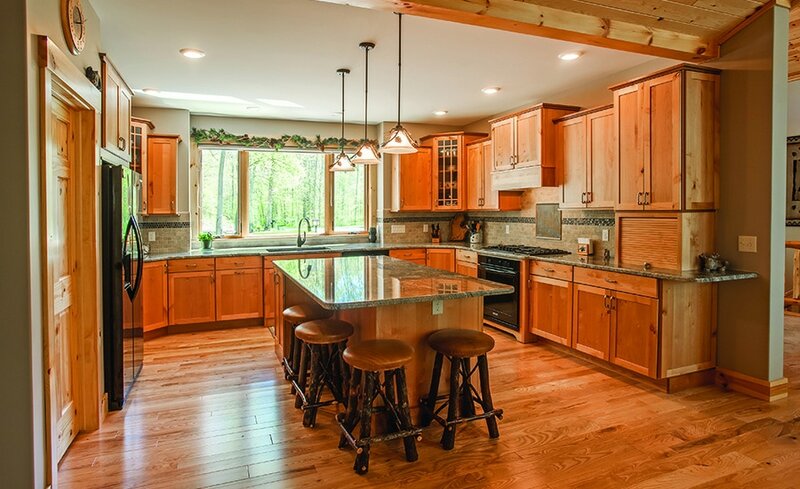 In the kitchen, knotty alder cabinetry and exquisite granite countertops continue the natural theme. 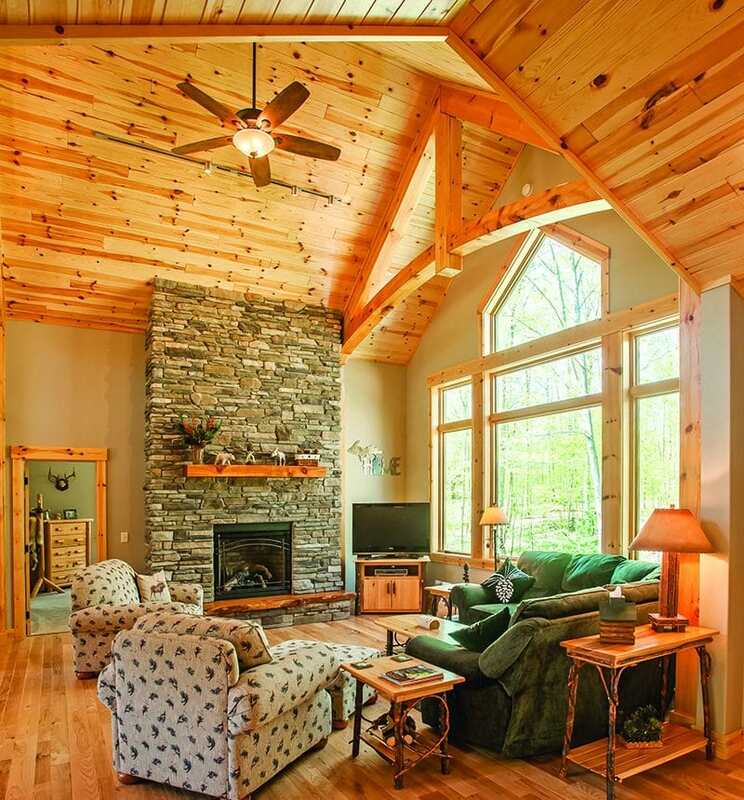 But the truest rustic-style statements are the generous views of the Northern Michigan forest that surround the home—views that are magnified in the four-season sunroom off the kitchen and living area. While maintaining a cozy feeling, the home is outfitted with five bedrooms and three baths—a master suite and bedroom on the main floor, and three bedrooms and two baths on the lower level. That’s plenty of room for the couple to easily welcome a steady flow of old friends from Howell as well as their son and his family who live downstate. Bill and Rosanne pretty much feel like they have it all. And with their daughter expecting a third baby boy, well, life in their rustic dream home promises to be even more happily full. Northern Home & Cottage Tour 2016: Traverse City Home Tour.